I did do a fair bit of shopping while I was in Japan but it definitely was not excessive or that expensive! I have been tip-toeing around the idea of getting a tartan scarf and could never find one which was decent (or decently priced for that matter), so when I found this one for 700 JPY (5.64 EUR/4.77 GBP) I knew I had to get it. It is so incredibly soft I want to cuddle it all day. 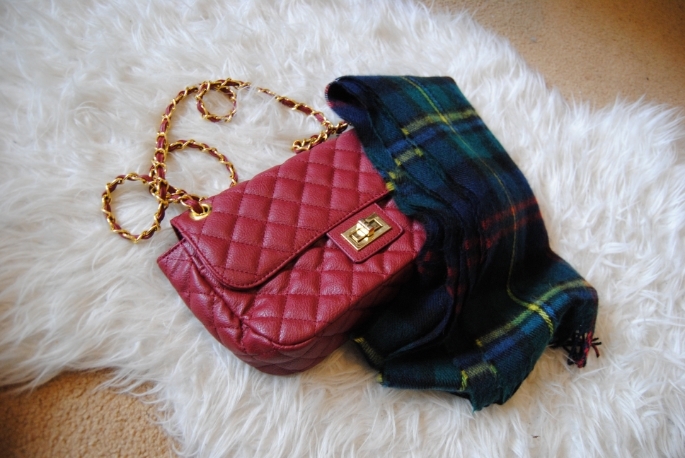 The other thing I got is that red quilt/chain bag. It is actually a lot more bordeaux colour than in the photo but man this bag is perfect. There is a back pocket, pocket just under the flap, the usual phone pockets inside the bag and the zip pocket. The material inside the bag is really good too, which surprised me because this bag cost only 1280 JPY (10.32 EUR/8.73 GBP)!